EMC, the global Cloud Computing behemoth and IDC (International Data Corporation), leader in market research and analytics have accomplished a very exciting study understanding the Internet of Things, and have come up with some mind boggling statistics. Picture this: By 2020, the Digital Universe will expand to 44 Trillion GB of data. Right now, we are producing 4.4 Trillion GB of data, which is doubling every two years. Digital Universe can be described as a world where digital data from every electronic device is being accumulated and stored: The residual product of the Internet of Things. We can include data which is coming in from the Internet, our mobile phones, computers, wearable gadgets, wirelessly connected gadgets such as TV, washing machines, cars and more in this Digital Universe. The report titled “The Digital Universe of Opportunities: Rich Data and the Increasing Value of the Internet of Things” tries to dig into the Big Data scenario where huge amount of information and insights is being created by wireless technologies, smart products and software-defined businesses all over the world. As per the report, there has been three main Digital revolutions which created the modern Digital Universe as we know it. The first one was when Digital Camera replaced films; the second was when Digital telephony replaced analog communication mode and the third was when TV went Digital. The current revolution is currently going on, wherein business entities all over the world are now turning into digital to adapt the business operations and management of day to day activities and converting them from analog to digital. – If we store this data inside Apple iPad Air tablets, then a stack of millions of tablets would be created which can reach 2/3rd of the distance between Earth and Moon, which is 157,674 mile or 253,704 kilometers. By 2020, there would be such 6.6 stacks. – If we assume every byte of data to be one gallon of water, then it requires just 10 second to fill an average household. By 2020, it will require just 2 seconds. Right now, almost 60% of the data is being produced at matured markets such as US and Europe. 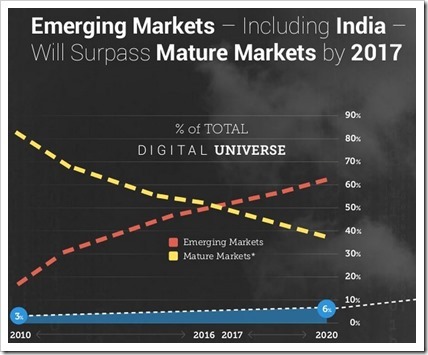 By 2020, emerging economies such as India, China, Russia and Brazil will account for majority of data production. With Internet penetration and mobile access increasing in these countries, this is not entirely impossible. Another very crucial observation is the role of Cloud in this Digital Universe. Right now, only 20% of the data is being touched by Cloud, which will expand to 40% by 2020. Enterprises and corporations have a very crucial role to play in this new technological push, as 85% of the data contained within the Digital Universe is being generated by enterprises, whereas only 15% is being created by the consumers. We had earlier shared that by 2020, there would be approximately 26 billion connected devices. The immense possibilities such billions of devices and trillions of GB of data will generate is simply too big to ignore. This is certainly a big chance for entrepreneurs to capitalize on this wave, and create ripples across the spectrum. Bad After Sales Service May Spell Doom For Micromax!